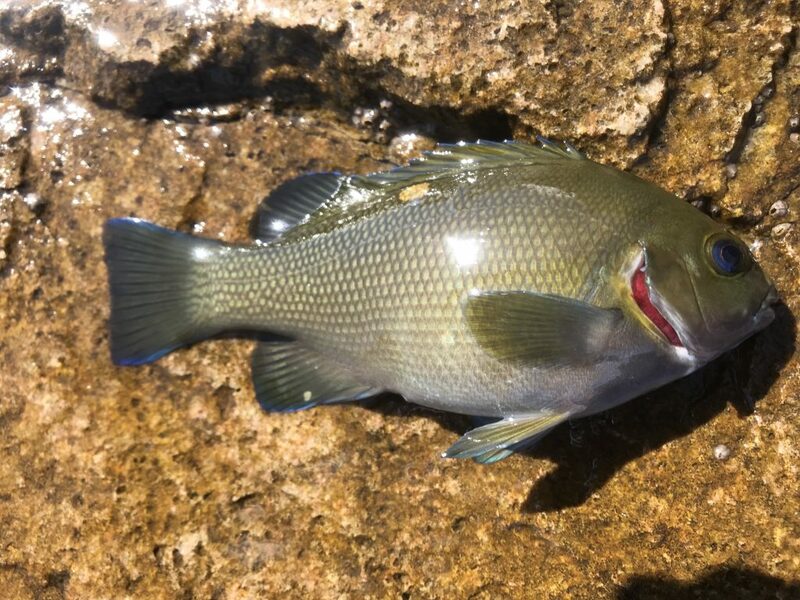 Opaleye are the Bluegill of the southern California coast: easy to catch, prevalent, and a blast on light tackle. They also happen to gorgeous. Note the blue edging of the fins and the iridescent blue eye that gives them their name. After a long day on a boat in the taxing summer heat of Southern California, the last thing most people would do is go fishing again, but as we’ve established, my judgment is impaired when it comes to fishing. As my cousin, Will Silvey, and I disembarked from the boat, I looked down into the water and noticed lots of little greenish-black fish shaped like Bluegill and a few slightly thicker, bright orange fish in the rocks of the marina. Will is a die-hard spearfisherman, and the finality of the sport makes spearos’ fish identification skills better than the average conventional angler. You have to know what you’re shooting before you pull the trigger, right? I asked Will, and he told me the greenish fish were Opaleye, an incredibly common fish along the SoCal coast. The orange fish, he told me, were Garibaldi. The latter are protected in California because they’re the state fish. According to the IUCN Red List, Garibaldi are a species of “Least Concern”. This means that they’re not at all Threatened. Rather, California protects them on purely emotional grounds as its state fish. Emotion has never trumped science in wildlife management before, so it’s shocking, right? Anyway, I decided that as soon as we returned to his hilltop apartment in nearby Laguna Niguel, I’d return to chase those little fish. He had class that evening, so sadly he couldn’t join me, but that didn’t stop me. I stopped by a grocery store, grabbed some frozen cocktail shrimp, and returned with a low-profile ultralight spinning setup spooled with 10-pound test to account for the rocks. The signs on the marina read very clearly “No Fishing From Walkways”, and I didn’t wanna attract negative attention, especially with hundreds of people swarming the marina. I looked around and failed to find an area without those signs. Then, I looked down. At the base of the walkways was a slight lip of concrete sticking out at the base of the eight-foot wall maybe six-to-12 inches in length. It was summer, and I rarely wear shoes during the summer. I briefly regretted my style choices as I gritted my teeth, grabbed the railing with one hand and vaulted onto the tiny strip below. My flip-flops grabbed, and I breathed a silent prayer before tipping my tiny, 1/64-ounce jighead with about a quarter of a cocktail shrimp and began sight-fishing to the little fish in the rocks. I caught an Opaleye so quickly that I was a bit shocked. Then another. I had several Opaleye before I caught any other fish. Sadly, that little concrete lip was still a few feet above the rock-filled water below and getting a good picture was out of the question. Fortunately, I did get a solid profile of an Opaleye facing to the right this year while fishing a lagoon not far from that original catch. Fun fact: though I caught my first (and most of my subsequent) Opalaye on shrimp, mussels, and squid bits, the go-to bait is apparently frozen peas. I’ve yet to try it, but I have it on good authority that it is untouchable. Maybe worth a try sometime? Read the next entry in #SpeciesQuest here: Species #103 — Salema.